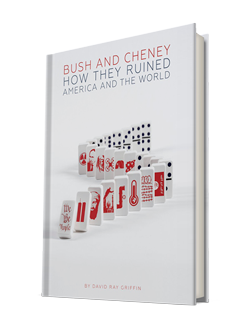 While the first part of Bush and Cheney focuses on the broader issues suggested by the title (including the Iraq and Afghanistan wars, the proliferation of Islamophobia, the shredding of the US Constitution, and the advent of drone warfare) the second part is devoted to Griffin’s detailed research into evidence that contradicts the official story of 9/11. . .